In late September Kodak announced that it is to stop making and selling inkjet cartridge printers. Kodak will focus instead on selling the ink cartridges for their printer range. According to their statement however, they will continue to sell the inkjet printers they have already manufactured but their sales will slowly cease in 2013. It seems a dwindling share of the toner and ink market, of which Lexmark are also suffering, are to blame for this. 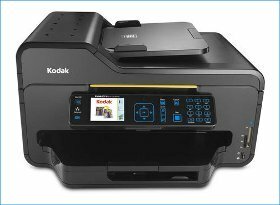 Kodak have said however that they will still offer full support for their customers who have bought their printers in the past and that the supply of toner ink for these machines will continue for years to come. Kodak was originally founded in 1889 and is probably best know for its photographic products such as negative film. They of course brought out the first digital camera but struggled as photographic film sales slowed up with the onset of rival digital camera companies. In January 2012 a team of specialists helped Kodak file for bankruptcy protection and it was hoped that theirs sales in the inkjet cartridges printer market would help them stay afloat. What does this means for the many Kodak printer customers who will be concerned about ink toner supplies? The short answer is that Kodak will continue to produce their ink cartridges for the established market, and of course, this means there will be a steady supply of compatible toner and ink available also. What do you think? Are you worried about how that leaves you for ink cartridges in Ireland? Or are you just happy to see the back of them. Share your thoughts with your friends or other Kodak users or leave us a comment. Great goods from you, man. I’ve understand your stuff proevius to and you’re just extremely wonderful. I really like what you have acquired here, really like what you’re saying and the way in which you say it. You make it enjoyable and you still take care of to keep it sensible. I cant wait to read far more from you. This is really a wonderful web site.